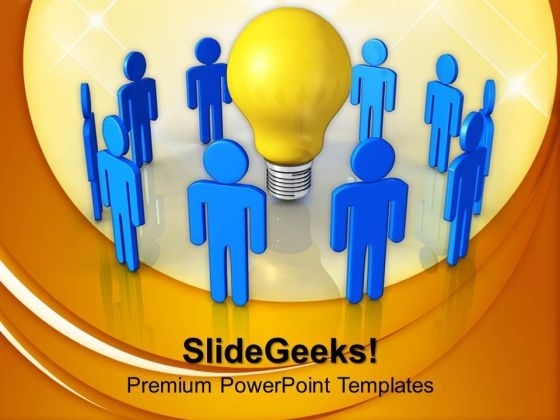 Blue Team With Yellow Bulb PowerPoint Templates And PowerPoint Themes 1012-This PowerPoint Template consists of Blue Team standing around the yellow bulb. It imitates the concept of Networking, Leadership, Team Leader, Teamwork etc. Adjust the above image in your PPT presentations to visually support your content in your Business PPT slideshows. Create captivating presentations to deliver comparative and weighted arguments.-Blue Team With Yellow Bulb PowerPoint Templates And PowerPoint Themes 1012-This PowerPoint template can be used for presentations relating to-"Bulb and blue models team, business, technology, light bulbs, teamwork, people" Deliver your ideas decisively with our Blue Team With Yellow Bulb PowerPoint Templates And PowerPoint Themes 1012. They help you look the audience in the eye. Craft plans with our Blue Team With Yellow Bulb PowerPoint Templates And PowerPoint Themes 1012. Download without worries with our money back guaranteee.